Ah the pitfalls of getting tattoos. They may look cool, they may mean something to the person whose skin they’re on, but please, please check the spelling before you go under the needle. Especially if you’re getting a tattoo that’s not in a language you can read. Foreign phrases are a popular tat of choice – a boring old English phrase can looks like prize-winning poetry if written out in French, for example. One should tread especially carefully, however, if the phrase you’re after is going to be inked in Japanese. Even the most basic Japanese symbols are beautifully intricate at the best of times. And, as Ariana Grande has just found out, can be easily mistaken for something else. In a now-deleted Instagram post, Ariana shared her new tattoo, which she got in celebration of her latest single 7 Rings. Scripted in Japanese, the tattoo should’ve read, somewhat unsurprisingly, ‘7 Rings’. Turns out, the tattoo (on her palm! ouch) actually translates to ‘Shichirin’, which means ‘small barbecue grill’. The Thank U, Next singer did take some time to reply to a few of her helpful fans pointing out the error. Ariana has been getting a few new inkings lately, and recently revealed a new tattoo of her favourite Pokemon. After her infamous split with Pete Davidson, Ariana also had to cover up one of her inkings, replacing it with a tribute to Mac Miller, who died last year after a suspected accident drug overdose. Previously, the tattoo on her ankle had read ‘8414’, in reference to Pete Davidson’s late father – a firefighter who died in the September 11 attacks. Now, however, the tattoo reads ‘Myron’, which was the name of Mac Miller’s dog, as this video points out. So, whatever you stance on tattoos in foreign languages or just tattoos in general, always check the spelling. 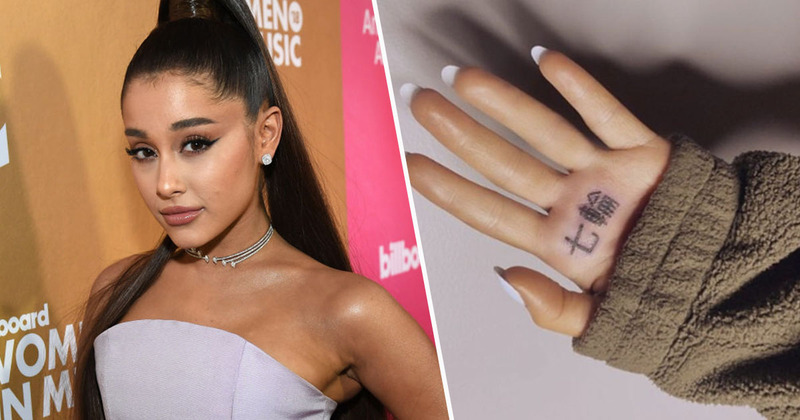 Ariana Grande Misspelled Her New Japanese Hand Tattoo and It Fully Says "BBQ Grill"